In tech journalism, rumors are like editorial gambits. Some seem like a sure thing, some just smoke and mirrors, while others still are very real but very far off. 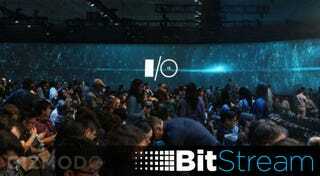 Earlier this week, I took a good guess at what I thought might pop up at Google I/O 2015. But there were a few things that were curiously missing. Here’s hoping these rumors don’t live out the rest of their lives as some mythical Loch Ness tech monster. Announcing Android Wear, Google’s smartwatch OS, for iOS would have been a huge mic drop for the wearables world. The idea wasn’t too far fetched considering there are images out in the internet wild of an Android Wear device pushing FaceTime notifications, but Google remained silent on any possible plans. The Chromecast was a gamechanger for streaming when it was launched in 2013 (note: not at Google I/O) but now it’s been near two years and Google still hasn’t upgraded the hardware. We heard murmurs back in October that new gear was coming to take advantage of second screen functionality, but it looks like that info is remaining a murmur and Google is taking a page out of the Apple TV refresh strategy guide. At least we got some new snazzy APIs though. Now, don’t get me wrong. Google had lots of interesting things to say about VR. New Cardboard! Jump! Crazy GoPro camera rigs! All great. But the Wall Street Journal said a small developer team was working away on an Android OS that would run on virtual reality headsets, and yeah, that never came up. It could be Google is more focused on getting some content out there before unleashing its OS, but either way, Android VR still resides in fantasy. Google has some really exciting new projects it’s working on through its Advanced Technologies and Projects group, including tech-infused textiles and evolving gesture computing to the next generation. As for Google’s current, far-reaching projects, there wasn’t much to report. Loon is still there—same with Ara and Tango—but nothing with any official launch dates or significant updates. Just business as usual. There’s always next year, I guess. Despite some internal reorganizing and a promise that it would return, Google Glass was almost completely absent except for a few sad individuals asking for updates (while wearing Google Glass. God bless you, sir). Some rumors concerning Google’s faceputer said Italian design firm Luxottica was behind the wheel and that a new version was “coming soon.” Oh well.